Helping individuals and brands DEVELOP who they are, CRAFT what they do and how they do it, and DELIVER their mission, vision, and values with their customers and the world. Ron is the guide, the success catalyst, businesses and individuals need to develop, create, and deliver value to themselves, their customers, and to the rest of the world. As a serial entrepreneur, Ron has earned his ability to help entrepreneurs, inventors, and businesses through years of empowering businesses from the ground up. Ron was born in Cleveland, Ohio on January, 5 1952. He currently resides in Blacklick, Ohio with his wife Terri. He has two daughters, Charli and Betsy. Ron is a graduate of Cleveland Heights High School, Class of 1969, and studied business and drama at Kent State University from 1969 to 1971. 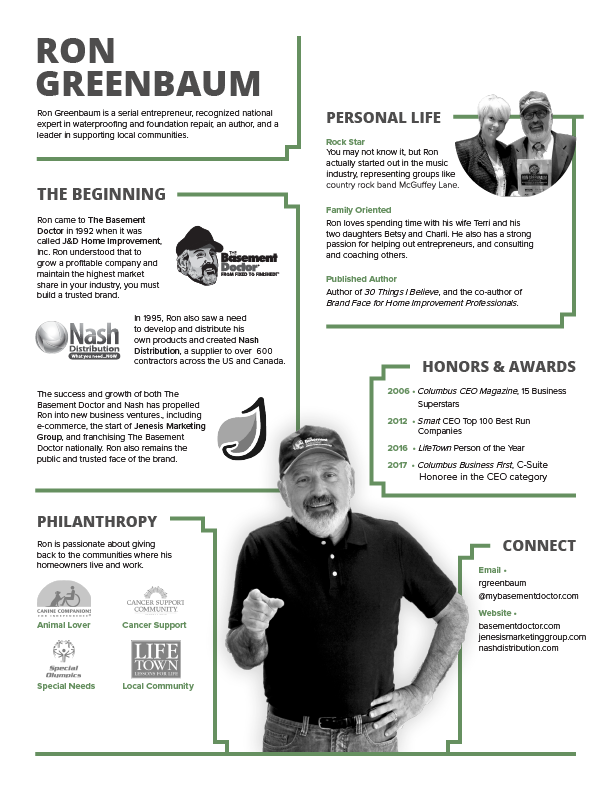 Greenbaum moved to Columbus, Ohio in 1971, and before making the switch to the basement waterproofing industry, was vice president of sales and marketing for local retail chain Waterbeds ‘n’ Stuff, and co-owner of a now-defunct rock ‘n’ roll production company Green Records Limited. 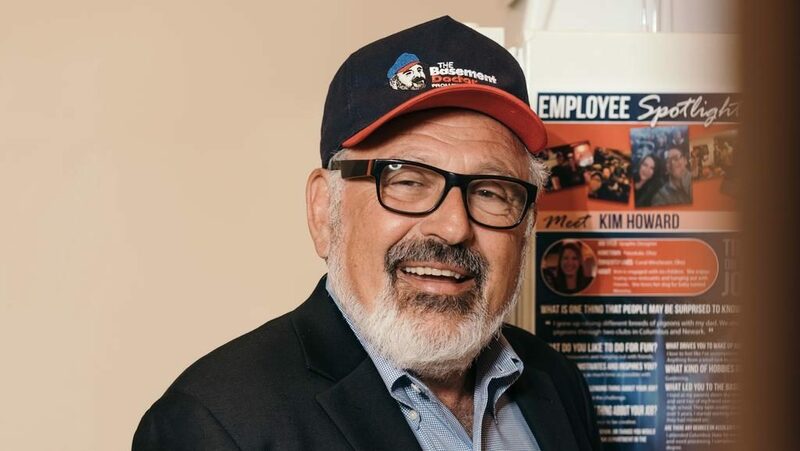 Ron worked in the basement waterproofing industry for five years before partnering in 1992 with Tom Johnston, owner of J&D Home Improvement, Inc., a Pittsburgh company that dated back to 1939. 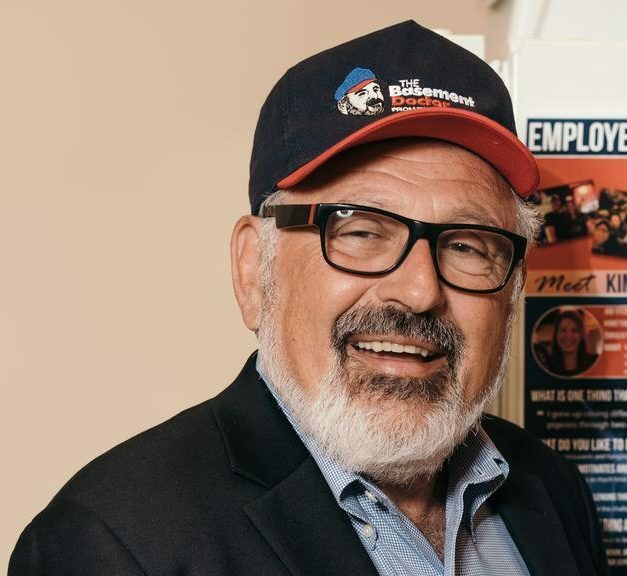 Ron started out in sales and marketing at J&D Home Improvement, Inc., which he eventually grew into The Basement Doctor, a nationally-recognized trademark, trusted brand, and now a successful franchise business. After growing The Basement Doctor, Ron created Nash Distribution out of the desire to develop and distribute products through a trusted, affordable, and high-quality distribution channel. It now supplies products to over 600 contractors across the United States and Canada. The success and growth of both The Basement Doctor and Nash has propelled him into new business ventures, including e-commerce opportunities like Indoor Gardening DIY, CrawlSpace DIY, the start of Jenesis Marketing Group, and franchising The Basement Doctor nationally. Ron has a proven track record of empowering individuals and brands develop, craft, and deliver who they are, what they do, why they do it, and how they do it with the world. He can guide you and/or your brand through a discovery process of change that grows and positions you for success and maximum impact. Contact him and his team now to start the conversation. Please share a little bit more about yourself and what you are looking for. Take a look at company's I work with.